Michael Mason | AKLeg Aug 29, 2018. Ketchikan – Alaska Governor Bill Walker signed legislation into law on Monday adding the Race to Alaska to the list of events eligible for a “race classic” game of chance permit. House Bill 18 will allow the Greater Ketchikan Chamber of Commerce to offer a “race classic” contest based on people guessing the winning time of the 750-mile Race to Alaska, which is a human-powered boat race from Port Townsend, Washington to Ketchikan, Alaska. Similar “classics” are offered by the Chamber’s of Commerce in Juneau, Fairbanks, Kenai, Seward, Petersburg, Delta, and Big Lake. 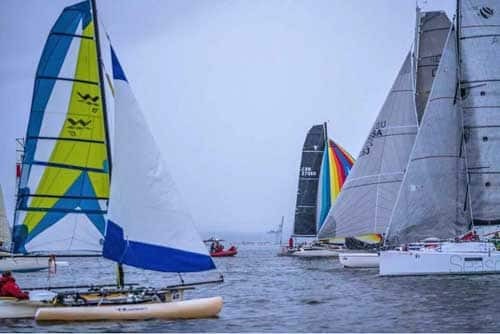 The 2019 Race to Alaska is scheduled to start on June 3 in Port Townsend, Washington. The deadline to apply to participate is April 15. House Bill 18 passed the Alaska House of Representatives by a vote of 36-1 in February of last year. The Alaska State Senate unanimously approved the bill on May 11 just before the Second Session of the 30th Alaska Legislature ended a day later. Alaska Governor Bill Walker signed HB 18 into law Monday during a ceremony at the Ketchikan Chamber of Commerce.